Looking into your partner’s eyes and saying, “I do,” will be one of the most memorable moments in both of your lives. It’s a powerful demonstration of love and commitment with all your closest friends and family there to celebrate with you. For such an important occasion, you’ll both want to look and feel your best. Here’s some tips for both the bride and groom on being your best self for your wedding. Make sure you take the time to put your look together prior to the wedding day. This means more than just having the dress and tuxedo picked out, but all of the accessories that you’ll be wearing along with the attire. Deciding on this beforehand gives you time to try everything on to ensure it’s the most flattering fit and accessory combination for you. 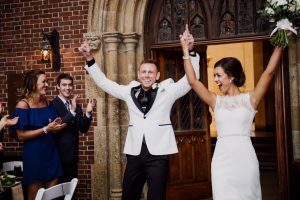 For the groom, common wedding attire that you’ll need along with your tuxedo or suit is a dress shirt, tie or bow-tie, watch, belt, and a pocket handkerchief. 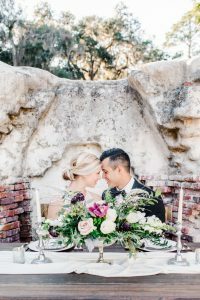 You can play around with the color combinations of your look to match the theme of the wedding or go for the more traditional black and white combination. If you plan on renting your tux, remember to put in a rental order several weeks before the wedding to ensure a proper fit. A pimple is the last thing you want to be dealing with on a day when all eyes are on you. Make sure you practice a regular skincare routine everyday utilizing a gentle facial cleanser and moisturizer. While it’s tempting to try a new face mask the night before your wedding, the best advice is to stick with what you already use. New products can cause your skin to become irritated and cause an unnecessary breakout. If you want to experiment with deeper cleansers and face masks, try them out a few weeks before the wedding to make sure they don’t cause any unwanted reactions. For the groom, facial hair is another component of skincare. Bad shaving habits can cause you to breakout or get razor burn. Make sure you’re regularly replacing your razor after every 6-8 shaves and storing it away from wet areas that can cause bacteria build-up. Having a couple’s spa day together is a great way to take care of the small grooming details prior to the wedding while also offering a way to relax and de-stress. If you don’t want to go out to an actual spa, having a DIY couples spa at home can also double as a romantic date night. Giving each other face masks, manicures, and doing each other’s eyebrows is a fun, albeit non-traditional way of bringing each other closer while also taking steps to feel your best. Mixing coconut oil or sesame oil with hot water for a relaxing massage is also a great way to unwind. This is essential in the weeks immediately prior to your wedding day. Try to keep a regular sleep schedule. Getting enough rest is important for managing stress and promoting a healthy nervous system. To get the best night’s sleep possible, consider turning off electronics an hour before bed and avoid eating any late-night snacks. After all, you want this to be your most memorable and happiest day of your life!